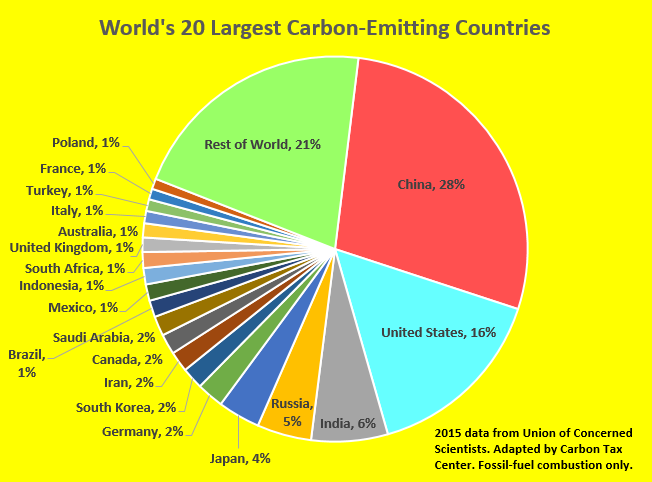 The last section of this (long) page lists and shows graphically the world’s 20 largest carbon-emitting countries. Canada has its own page, where we summarize its plan to adopt a nationwide carbon price in 2018 and also report in detail on British Columbia’s carbon tax, the Western Hemisphere’s (if not the world’s) most comprehensive and transparent carbon tax. 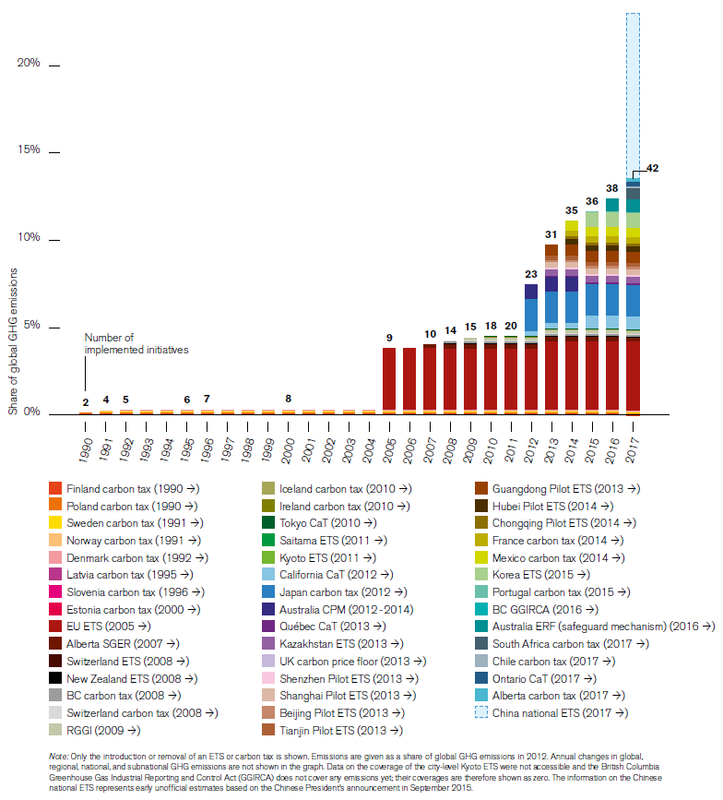 This excerpt from Carbon Brief’s “Paris Climate Pledge Tracker” shows the INDC’s for the world’s four largest GHG emitters.The reader is urged to view or download the World Bank’s latest (2018) State and Trends of Carbon Pricing report, for its comprehensive overview on carbon taxes and cap-and-trade systems in place or under consideration around the world, along with national and subnational particulars. 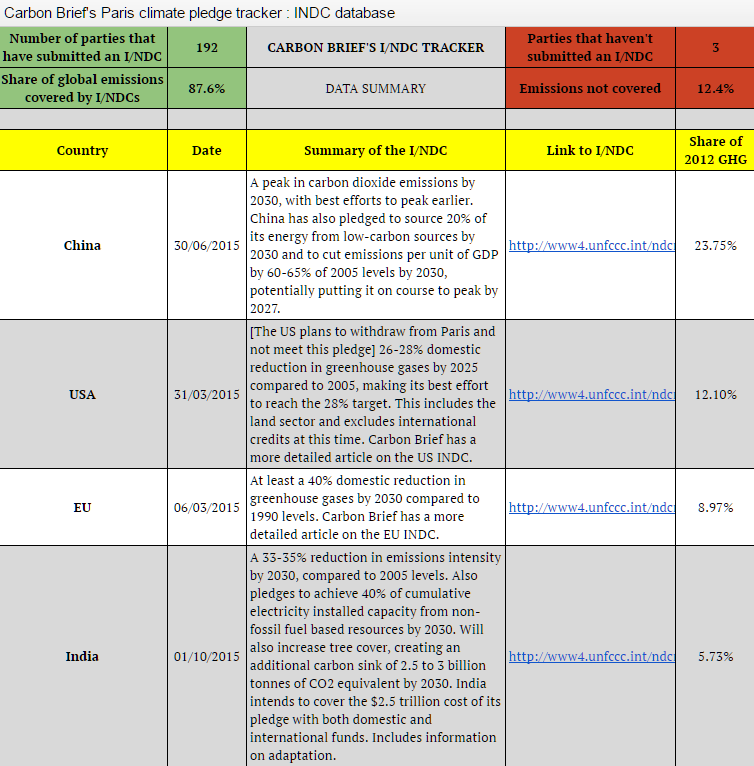 Please also note Carbon Brief’s Paris climate pledge tracker, an evolving on-line spreadsheet that summarizes 190 nations’ INDC’s (individual nationally-determined commitments) that constitute the Paris climate agreement. The Carbon Brief document also shows each nation’s share of world 2012 greenhouse gas emissions. The three graphics directly below are from the World Bank’s 2016 report (to be updated shortly to the 2018 report; we also show them slightly out of order). Source: World Bank (“State and Trends of Carbon Pricing, 2016”). 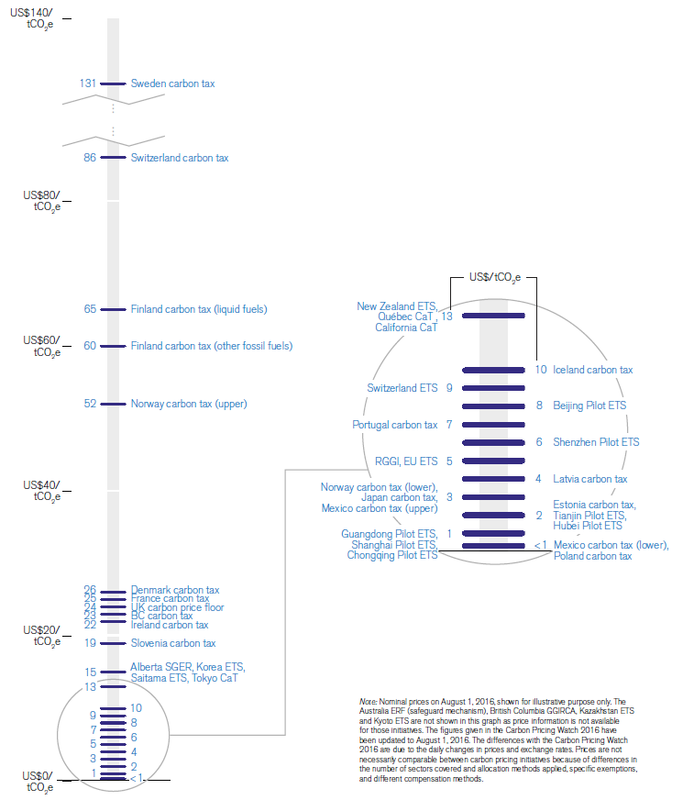 Note, ETS refers to emissions trading schemes (i.e., cap-and-trade). 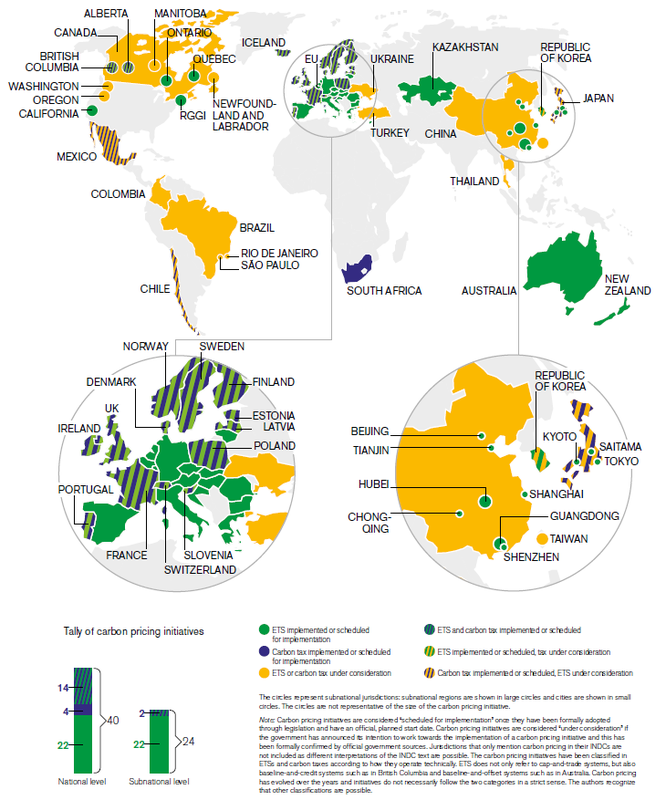 Source: World Bank (“State and Trends of Carbon Pricing, 2016”). As noted, there’s rich detail in the World Bank report. Here’s the link again. The U.K. — England, Scotland, Wales and Northern Ireland — has maintained a carbon tax since 2013. Technically, the tax is a “carbon price floor” that functions as the minimum price that fossil fuel producers pay to emit CO2. Whenever the carbon price in the EU’s Emissions Trading System (ETS) is less than the U.K. minimum — which has been essentially all of the time since 2012 (see graphic; page down once) — the producers pay the difference to the British Treasury. Brits sometimes call their carbon tax a “top up” tax since it was intended to top up European carbon prices. The mandated rate for 2016 was 18£ per metric ton. This equated to $24-$25 per short ton, at last year’s average 1.5-to-1 sterling to dollar exchange rate (the exchange rate is a good deal lower at this writing in 2017, however), and converting metric to short tons. 2016 Carbon emissions from U.K. sources were down 7% from 2015, and 37% from 1990. Source: 2016 UK Greenhouse Gas Emissions, Provisional Figures, Dept for Business, Energy & Industrial Strategy, 30 March 2017 (see link in next line of text). U.K. CO2 emissions have fallen steadily since 1990 and even more sharply since 2013 (see graph). By 2016, emissions had dropped to levels not seen since the last decade of the 19th Century, as Simon Evans pointed out in a March 2017 post on Carbon Brief. As in the United States, the lion’s share of the drop in U.K. carbon emissions has occurred in the electricity sector. Based on provisional government figures (in Table 1), 2016 emissions of carbon dioxide from electricity generation were down by 50 percent from just six years earlier (2010) and by 24 percent from a year earlier, 2015. Reading from graphed data in the government report, 2016 power-sector emissions were down more than 45 percent from 2013, the first year of the carbon tax. For all sectors — transport, residential, industry and so forth, in addition to power stations — CO2 emissions in 2016 were down 25 percent from 2010, and 7 percent from 2015. Again, reading from graphed data, the drop for 2016 from 2013, the first year of the carbon tax, appears to have been 19 percent. Evans notes, however, that “The future of the carbon price floor is uncertain; it has only be fixed out to 2021,” as some argue that the tax will be mooted by closure of remaining coal-fired capacity in the U.K. and that its continuance will lead to increased emissions through importation of cheaper and dirtier electricity from the European continent. 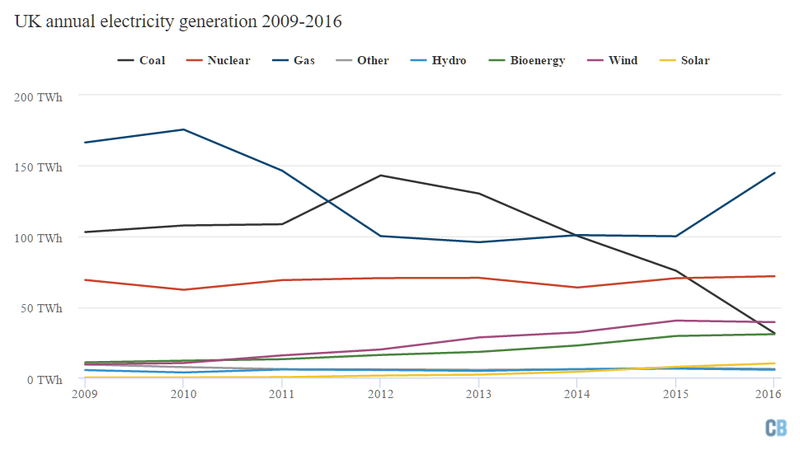 U.K. electricity generation by source. From BEIS Energy Trends table 5.1, via Carbon Brief. Ireland is a pioneer in the implementation of a carbon tax. This has allowed us to avoid (more) increases in income tax which would have further reduced disposable income, increased labour costs and destroyed jobs. It is also facilitating us in meeting our very demanding legally binding obligations to reduce greenhouse gas emissions, and provides support for the creation of new jobs in improving energy efficiency and growing the low carbon economy. Ireland’s carbon tax covers nearly all of the fossil fuels used by homes, offices, vehicles and farms, based on each fuel’s CO2 emissions. It began in 2010 at €15/ton and rose to €20/ton in 2012, where it remains today. Solid fuels (coal and peat) were added in 2013 at €10/ton after concerns from agricultural interests were resolved, and that price has since risen to match the €20 price on other fuels. The tax generates roughly €100 million in revenue per €5 of tax, meaning it currently draws about €400 million annually. Over the last three years, with its economy in tatters, Ireland embraced a novel strategy to help reduce its staggering deficit: charging households and businesses for the environmental damage they cause. The government imposed taxes on most of the fossil fuels used by homes, offices, vehicles and farms, based on each fuel’s carbon dioxide emissions, a move that immediately drove up prices for oil, natural gas and kerosene. Household trash is weighed at the curb, and residents are billed for anything that is not being recycled. The Irish now pay purchase taxes on new cars and yearly registration fees that rise steeply in proportion to the vehicle’s emissions. Environmentally and economically, the new taxes have delivered results. Long one of Europe’s highest per-capita producers of greenhouse gases, with levels nearing those of the United States, Ireland has seen its emissions drop more than 15 percent since 2008. Although much of that decline can be attributed to a recession, changes in behavior also played a major role, experts say, noting that the country’s emissions dropped 6.7 percent in 2011 even as the economy grew slightly. Notably, the Irish carbon tax was designed to fill gaps left by the European Union Emissions Trading Scheme (EU ETS), which addresses only large polluting firms and accounts for only roughly 40% of emissions sources while being hampered by volatility. The case of Ireland demonstrates the potential for EU-wide cooperation in setting an effective harmonized price on carbon in preference to a piecemeal and volatile ETS. Ireland’s Vehicle Registration Tax is also partly emissions-based. A VRT Calculator on the Irish Tax & Customs website provides a means to estimate the amount of tax on a vehicle based on Make/Model/CO2 Emissions. Interestingly, the CO2-sensitive VRT has touched off a pronounced shift to diesel vehicles, which emit less CO2 but more of other pollutants with localized health impacts. Changes to the tax rate in Budget 2013 are detailed here. Finally, the law firm Arthur Cox offers these useful guides ( & ) to Ireland’s carbon tax. Australia instituted a carbon tax on July 1, 2012 and repealed it two years later, on July 17, 2014. Both events were milestones. Though some countries, notably Sweden, have had longer-standing and stronger national carbon levies, Australia’s was the first explicit national tax on carbon emissions. The repeal was also precedent-setting, and predictably it has garnered far more global attention (and hand-wringing) than did the tax itself. The tax level, $23 per tonne (metric ton), equated to $19.60 per U.S. ton of CO2, at the U.S.-Australian dollar exchange rate (1.00/0.94) in July 2014. In 2010, the Labor prime minister, Julia Gillard, said she would look at carbon-pricing proposals, but also promised, “There will be no carbon tax under the government I lead.” Then, under pressure to form a minority government, she made a deal with the Greens and agreed to legislate a carbon price: a tax by any other name. The heat, anger and vitriol directed at her as a leader — and as Australia’s first woman to be prime minister — coalesced around the promise and the tax. It grew strangely nasty: She was branded by a right-wing shockjock as “Ju-Liar,” a moniker she struggled to shake. The political cynicism surrounding the carbon tax certainly reduced Ms. Gillard’s political capital, but it was a perceived lack of conviction in the policy itself that damaged the pricing scheme’s credibility. See also Australian ABC News’ superb Timeline of the tax’s torturous political path, posted in July 2014. Predictably, the Times’ news dispatch, Environmentalists Decry Repeal of Australia’s Carbon Tax, cast the repeal as greens vs. economy, ignoring the reductions in carbon intensity in the power sector (which helped blunt the tax’s cost) as well as provisions that directed revenues to households to mitigate consumer impacts (see below). In May 2013, one of Australia’s major papers, the Age, reported that national electricity generation with highly polluting lignite coal had fallen 14% vs. the same year-earlier period in the tax’s inaugural nine months, with conventional coal-fired generation also falling, by nearly 5%. During the same period, renewable electric generation “soared” by 28% and electricity output from lower-carbon methane increased by 9.5%. While factors such as greater hydro-electricity availability, flooding of a major coal mine, and implementation of a 20% renewable-energy target probably contributed to the declines in coal use, the 2.4% reported drop in overall electricity generation suggests that the carbon tax played a part. Use of the carbon tax revenues was complex. Some went to the Australian Renewable Energy Agency for project funding and other monies providing “a raft of other compensation and development funds focused on biodiversity, low carbon agriculture, small business grants and support for indigenous communities,” according to Big Pond Money. More than half of the revenue was said to be earmarked to support low and middle income households to cover the increase in prices that business will pass on to consumers. The government also acknowledged, according to Big Pond Money, that the carbon tax would take more from 3 million households than it would return, while 2 million households would be no worse off and 4 million households better off. A Household Assistance Estimator developed by the authorities was said to provide a means for families to estimate how they would fare financially under the carbon tax. A later AP story hammered Australia’s carbon tax, asserting that “Voters have never stopped hating the tax and its effect on their electric bills” and predicting that it would doom the ruling Labor Party in the Sept. 8, 2013 elections. “Longtime Labor Party supporters — even people who have helped cut pollution by installing solar panels at home — have flocked to the opposition,” AP reported, in Australian Gov’t Faces Carbon Tax Backlash at Poll (Sept. 6, 2013). “The government estimated the tax would cost the average person less than AU$10 per week,” said AP, “but three months after it took effect, most Australians surveyed by policy think-tank Per Capita said it was costing them more than twice that much. But they also expressed confusion, with most blaming the tax for higher gas prices even though it is not levied on motor fuel purchases.” In an e-mail, cap-and-dividend proponent Peter Barnes blamed the tax’s unpopularity on the absence of “100% dividends, fully transparent and highly visible.” We don’t disagree. 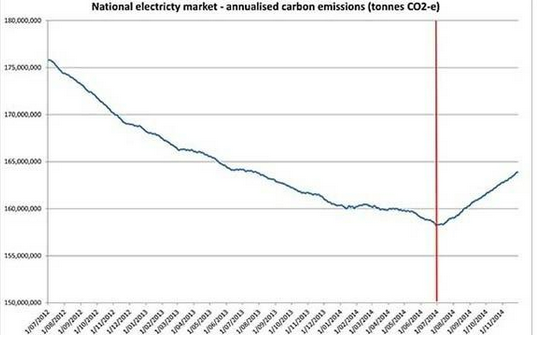 Update (January 2015): In case anyone doubted the effectiveness of taxing carbon pollution, the following graph of power plant CO2 emissions published in Australia’s Guardian shows what has happened in the year since the tax was repealed. The vertical red line is the repeal date. See also, Emissions for power sector jump as carbon tax ends (Sydney Morning Herald, 1/7/15). Chile’s tax, which targets large factories and the electricity sector, will cover about 55 percent of the nation’s carbon emissions, according to Juan-Pablo Montero, a professor of economics at the Pontifical Catholic University of Chile, who informally advised the government in favor of the tax. At $5 per metric ton of carbon dioxide emitted, Chile’s tax is lower than the $8-per-metric-ton carbon price in the European Union’s carbon-trading system, which has often been criticized as too lax. But it is higher than a carbon tax introduced in Mexico in January. Chile’s approval of a carbon tax owes much to its positioning inside a broader tax package, experts said. At the same time that it passed the carbon tax, the Chilean government raised corporate taxes substantially, in a bid to increase revenues for education and other projects. As a result, the carbon tax raised less debate within Chile than it might have otherwise, though electricity companies have objected. Sweden’s carbon tax history and current status were summarized intelligently in a 2013 blog post by “realmelo,” who appears to be a graduate student in economics in British Columbia. Click here for her/his useful, brief report. This measure is essential to encourage energy efficiency and the development of renewable energy in the transport and construction sectors, which have the largest potential for investment and job creation. This change can be made by revising directive 2003/96/CE restructuring the communal taxation framework for energy products and electricity, which has remained unchanged for several years. It may also be undertaken by Member States individually. It should also be based on the principle of fiscal neutrality to avoid increasing mandatory contributions and instead favour the transfer of taxation to fossil fuels. The context is favourable because the drop in the price of hydrocarbons and gas is significant enough so that the carbon component will not result in increasing the final bill including all taxes for consumers (including motorists). Thus, the introduction of the carbon component preserves purchasing power over the short term, but gives a clear signal of the need to quickly carry out energy retrofitting on housing, purchase clean vehicles and develop renewable energy (especially renewable heat and biogas). The goal is not to impose a single worldwide price or a world CO2 market, but to bring together all committed countries and companies around common principles: ensure the carbon price is within the range of between $10-20/tonne before 2020 and $30-80/tonne in 2030; remove subsidies for fossil fuels; prepare for price convergence through networked carbon markets or mechanisms for rebalancing competition such as carbon inclusion mechanisms. The alliance may rely on the Carbon Pricing Leadership Coalition, on condition that it follows its road map and expands it to new countries. Finland enacted a carbon tax in 1990, the first country to do so. While originally based only on carbon content, it was subsequently changed to a combination carbon/energy tax (U.S. EPA National Center for Environmental Economics). The current tax is €18.05 per tonne of CO2 (€66.2 per tonne of carbon) or $24.39 per tonne of CO2 ($89.39 per tonne of carbon) in U.S. dollars (using the August 17, 2007 exchange rate of USD 1.00= Euro 0.7405). Current taxes are summarized in a Ministry of the Environment fact sheet Environmentally Related Energy Taxation in Finland. The material below presents data developed by the Union of Concerned Scientists. indicate its depth and scope. The entire 114-page book may be downloaded here. Last, we note two other works that address impacts of in-place carbon taxes. A 2004 paper by Berkeley Prof. David Rich, Climate Change, Carbon Taxes, and International Trade, is focused on reconciling national carbon taxes with international trade agreements and summarizes, but it briefly reports on CO2 reductions from carbon taxes in Sweden, Finland and Denmark. Rich’s paper cites International Trade and Climate Change Policies (preview only), a volume in the Royal Institute of International Affairs series and a possible rich source of data. We invite visitors to this site to read these works and share their observations with us.